French President Emmanuel Macron is not a very experienced politician. His attitude to Armenia speaks of the lack of a balanced policy towards the Muslim world, in particular, Turkey. He practically sided with the rich Armenian diaspora, which does not spare financial resources for lobbying its interests. This is an important part of this issue, pundit and ex-diplomat Fikrat Sadixov said in a comment on the decision of the French president to establish a national day of remembrance of the so-called “Armenian genocide”. I would not call such an attitude of the French "love" to the Armenians, since everything is regulated on a pragmatic basis. Armenians appeared in France many centuries ago. And as a result of this influx, especially after the end of the First World War, they managed to infiltrate the various structures of the socio-political, economic, financial and cultural life of France, the pundit says. Today, I must admit that many of them are not just ordinary citizens of France. These are those individuals, circles that strongly influence the social and political life of France itself. And by exerting pressure, they seek the adoption of various resolutions in the French parliament. Some political figures of France dance to the tune of the Armenians, he adds. In due time, when sober-minded politicians, for example, the same Charles de Gaulle, were at the head of France, Paris did not allow itself such overtures to the Armenians, according to the former diplomat. Over the years, a different situation has arisen - attitudes towards Turkey have changed in France. Today, France is one of the countries opposing Turkey’s accession to the European Union. Paris needs to slow down Turkey’s accession to the EU by any means. And on this issue against Ankara, the so-called “Armenian genocide” is used that alleges that 100 years ago some events occurred that influenced the fate of Armenians in Turkey. Various legends are invented that overgrow with some fantastic additions. The pundit says Macron has many problems at home and he needs to tackle them. He at least should deal with those "yellow vests", the number of whom has already exceeded 100,000. These protests not only subside, on the contrary, they have taken an organized form. The trade unions joined them, the protesters voiced not only economic but also political demands. There are many crippled and wounded among the protesters. People with injuries go to these protests. Macron needs to address this problem first. If he believes that these overtures to the Armenians will improve the situation and distract public attention from what is happening in France, and then he is deeply mistaken, he adds. 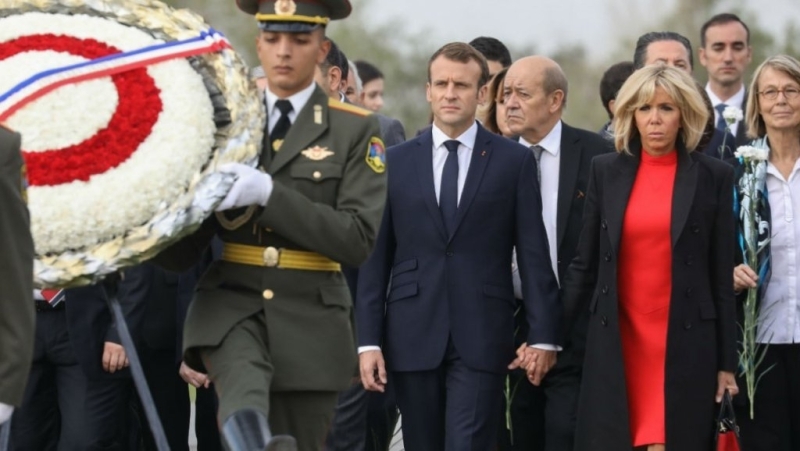 Asked to comment on a law, passed under the ex-President of France Nicolas Sarkozy, which criminalized denying the "Armenian genocide", which was later annulled, the pundit said Macron would also suffer a similar fate. The criminalization of the negation of the so-called “genocide” was canceled in due time, because the bill itself acted contrary to the principles of interstate relations and international norms. This initiative, by the way, also did not correspond to elementary logic. They wanted to compare the so-called “Armenian genocide” with the Holocaust, which, in fact, is incomparable. Therefore, this attempt was not crowned with success, Sadixov says. At the same time, if Macron is seriously pressured by the same rich Armenian diaspora circles, he can reanimate this issue, and try to achieve success. Macron is considered the president of the rich. When he was elected president, the French expert community said that this man became president thanks to the capital of the rich. Imagine how many rich people are among the Armenian diaspora. Naturally, the money you need to work. I think Macron does this very successfully. On “You mentioned the protests of the "yellow vests." But France also has a genocidal problem regarding the Algerians, to which Paris denies involvement,” the former diplomat said that indeed, in France it is denied. Algeria was for a long time a French colony, there was a fierce war; there was a deliberate murder of the inhabitants of this country. And only General de Gaulle found the strength to stop it and sign the well-known Evian agreement. However, the fact itself cannot be erased from history. They caused enormous damage to the Algerian people, and many peaceful people were killed and maimed. But the thing is that the Algerian diaspora is not so strong and is not so actively represented in French society. Therefore, the fact that the French committed in Algeria is relegated to the background, and the problem that has been sucked by Armenians comes to the forefront, which has no relation to France. He also rules out any breakthrough in the resolution of the Karabakh conflict as long as France is a co-chair of the OSCE Minsk Group. France is one of the countries co-chairing the OSCE Minsk Group and this pro-Armenian position of France should alert us. Asked “is there any hope for the objectivity of France in the settlement of the Karabakh conflict?” he said that France, as a co-chair of the OSCE Minsk Group, takes an extremely subjective position, it is not based on an objective analysis and fair approach to what is happening in the South Caucasus region, and regarding the Karabakh conflict. Such an attitude towards Armenia naturally deprives, in a certain sense, France, of a moral and political right to objectively judge how the Armenian-Azerbaijani conflict should be resolved. Although officially Paris recognizes the territorial integrity of Azerbaijan, but this is not enough, the pundit is certain. A co-chair, who mediates a protracted conflict, should take an impartial position. The co-chair, which is France, should take a position based on the principles of international law, the rules of justice, which can lead to a final solution to this problem. This is not seen today in the position of France, he believes. Unfortunately, France’s pro-Armenian position says that France’s approach to solving this problem can hardly lead to objective results. It is clear that in this case, we do not mean the whole of France, but the current leadership of the country, headed by its president, who demonstrates an extremely subjective position, frankly disregarding objective realities. This is not the approach that can lead to an objective solution of the Karabakh problem, the former diplomat concluded.